As of 1851 in Melbourne, there were very few iron railings or balconies in the city, and yards were generally roughly fenced in with stringy-bark palings that were up to six feet high. Around this time, light timber-frame building designs began to be imported from America, as well as designs for picket fences. Picket palisades (palings) provided a decorative and inexpensive way to determine domestic boundaries, and the picket heads had stepped, pierced, spiked, or convoluted tops. They increased in popularity because their simplicity was also a good match for the buildings they protected. In 1854, iron palisade fence designs began to appear in building publications, and by 1856, the need for a foundry devoted to the manufacture of metal castings began to surface. ‘Light and fanciful ironwork’ also began to be appreciated for its superiority in terms of strength, beauty and durability, and ads for ornamental castings began to appear in industry journals. By the end of the first gold mining boom in 1859, many local founders began moving from the production of quartz-crushing equipment to that of cast-iron equipment for construction. 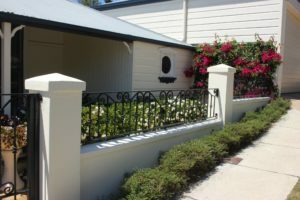 In terms of urban Australian fences, by 1860 the ‘better’ houses began to be fenced off from the road by the use of handmade iron gates or railings. Around 1862, cast-iron palisading began to appear in builders’ ‘price books’ and patterns were also offered, and preference was given to local cast-iron patterns over English castings, particularly in Victoria. By 1869, pre-fabricated iron fencing or ‘galvanized-wire cable-strand fencing’ began to be advertised. Timber Dowel and Rail Fences were constructed of bluestone plinths (the projecting base of a wall), with square section timber dowels that actually penetrated each timber rail. In Early Timber Picket Fences, picket heads were either flat or V-shaped and formed from split timbers, and later, machine timbers were used especially on urban fences. Cast-iron Palisade Fences were fashioned from spearheads and railing shafts that were cast together as one piece so that the shaft could be decorated either with a bundle of four staves or as an overall pattern. They were then inserted into drill holes in the bluestone plinth that was set in molten lead with penetrated flat metal rails. From 1850-52, flat and Corrugated Galvanized Cast-iron Sheet Fences began to be imported. By the 1870’s galvanizing factories or ‘works’ were located in all capitals. Galvanizing is the process of coating iron or steel with a protective layer of zinc. Early sheets had a 5-inch dimension compared to the present dimension of around 3.5 inches, and they were often used in combination with timber ridge capping and a timber plinth (the projecting base of a wall). Imported from 1855, Francis Morton Portable Iron Fences consisted of an outer rectangular frame constructed of a rolled iron bar. That is, until local cast-iron manufacturers began manufacturing them after 1860. Advertised as ‘wire cable strand fencing’, Motley & Green Portable Iron Fences were much more stable and were eventually replaced with rolled steel rods, and in some cases details were formed from wrought iron. In Hooped Metal Rod Overlapped Palisade Fences, rolled rods were formed into overlapped palisades. Fixings were very simple and included gate hinges, gate latches and diamond-shaped spearheads. An additional metal bar often formed the bottom rail and this was generally fixed to masonry paving. Whoever thought fences in Australia were so diverse! After a fence that will stand out amid the rest of the urban designs out there? Contact the experts at Dean-Wilson Iron on 3814 0076.